In the tutor feedback report the following additional artist research was suggested. Research artists such as Andy Goldsworthy (1956- ) and Richard Long (1945- ). 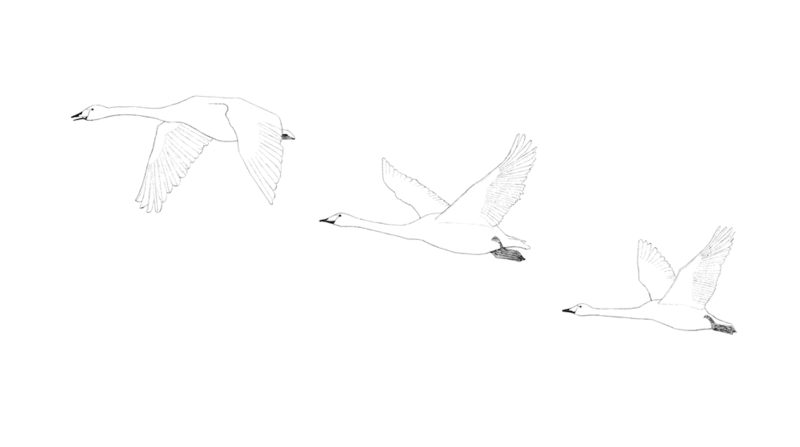 Perhaps even check out the work of Ian Hamilton Finlay (1925-2006) (if you ever get a chance to go to Dunsyre in the Pentland Hills visit Little Sparta, his beautiful garden) and his son Alec Finlay (1966- ) who further explores nature and our intervention of it. 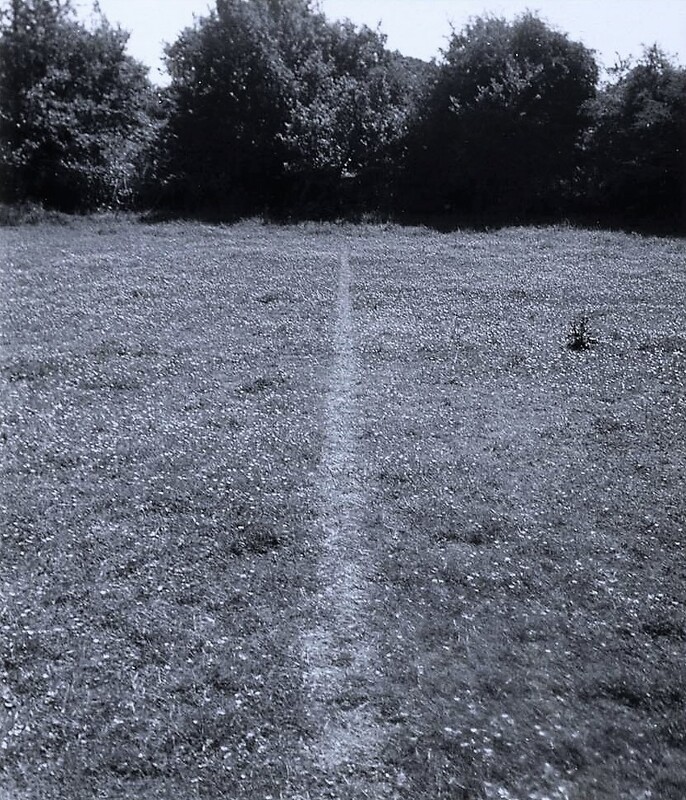 Richard Long’s has changed the face of British art since he started working. His works have changed the concept and expanded the boundaries away from traditional materials of what is possible in drawing, sculpture and art in general. He is acknowledged as on of his generations most influential artist. His sculptures are usually formed by minerals native to their location and often take the form of geometric shapes—circles, lines, ellipses, and spirals. These works are often on location but when working on more conventional canvas he also incorporates these mineral materials such as mud and earth into the work. Long’s work in native materials on location are left in place and await nature claim to take them back where they will then erase any trace of his intervention. His interventions are general on a small scale and thus having minimal impact on the landscape. He makes small gestures with grand meanings and allows the beauty of nature to be the star of the show, the true artwork. Tucked away in the hills outside Edinburgh is an old farm that has been transformed and re-purposed. 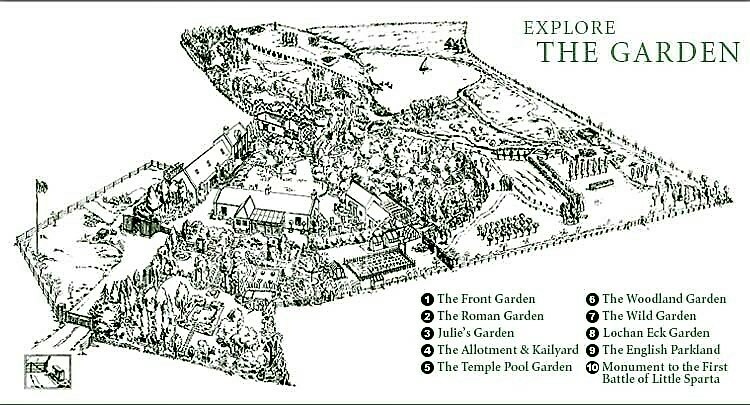 Over many years starting in 1966 it has been piece by piece emerged to become a the most celebrated twentieth century garden in Scotland. Created by Ian Hamilton Finlay, a poet and gardener and his wife and later continued by their son Alec Finlay. Finlay’s concept was to have a garden poem. He combines interesting layouts intuitive planting, sculpture along with poetry placed strategically in the space. 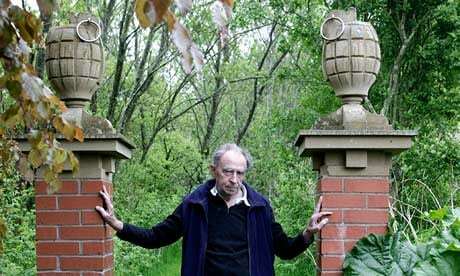 In the ‘60’s he became interested in ‘Concrete Poetry’ with many of the gardens works created by his utilising quotes. 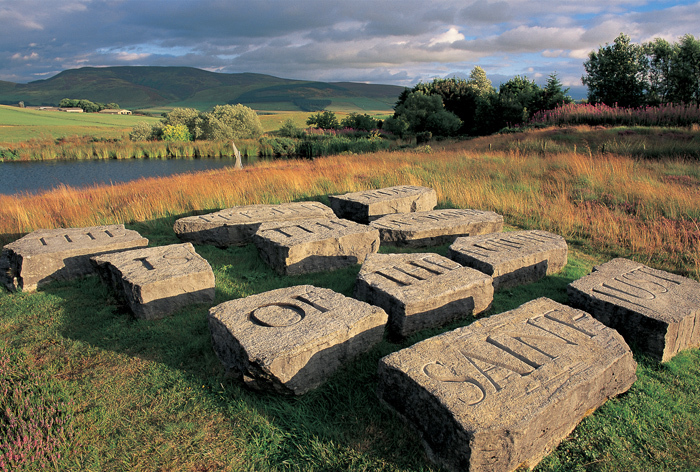 One of the works is a set of eleven massive blocks of stone [The Present Order], each with a word carved on the top. The quote is an attribution to Saint-Just, the implacable ideologue of the French Revolution, intended as a rebuke to a corrupt society. They seem to be the ruins of some great building. The quote noted above can be re-arranged to give the opposite meaning, Finlay’s sense of humour and his love of hidden and second meaning being evident. The gardens can be visited during the summer months. These Gardens are on my must see list, though I don’t know when I may see them in the flesh. Whilst researching Ian Hamilton Finlay I stumbled across a couple of websites with photos of environmental art including those below. These add a bit of fun to environmental art. Much environmental art can be ‘missed’ by those not normally interested in art. These pieces and objects in the Gardens of Heligan pique their interest and draw then in where another, less subtle pieces may pass them by. Gillanders, R. and Finlay, A. (1998). Little Sparta. Edinburgh: National Galleries of Scotland. Tutor feedback on section 3 noted additional artists for research. Noted below are another two artists with research relevant for this section of the course and the course in general. Mompó was born in Valencia, Spain and studied art here. 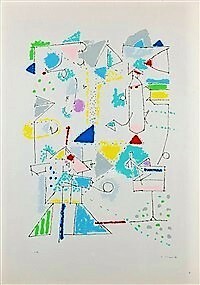 In the 1950’s he was one of the more renown of the Spanish abstract artists. In his younger years he moved throughout Europe staying in several places including Rome, Paris and Holland. 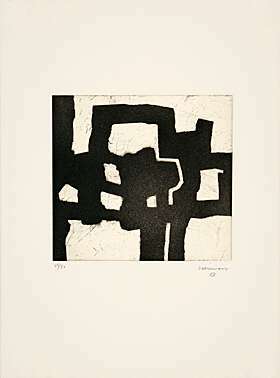 It was in Holland that he met Mondrian, who later became one of the major influences on Mompó. 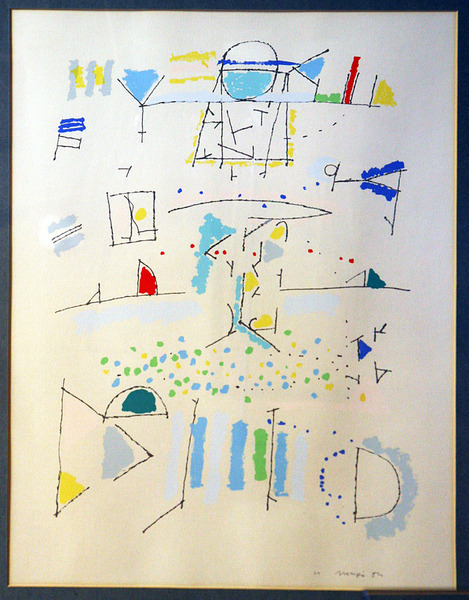 The works are generally small brightly coloured graphics in an abstract manner giving his interpretation of the urban themes he depicted. Each of his works contains a narrative element. This narrative is done in a simple almost comic or doodled style using bright colours and abstract shapes. 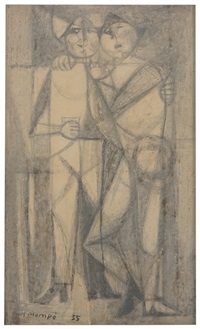 An example of this is his painting “Mercado (1969)”. The subject of this painting is the Mercado, the market. Mompó uses the everyday urban scene of the market place for his subject. 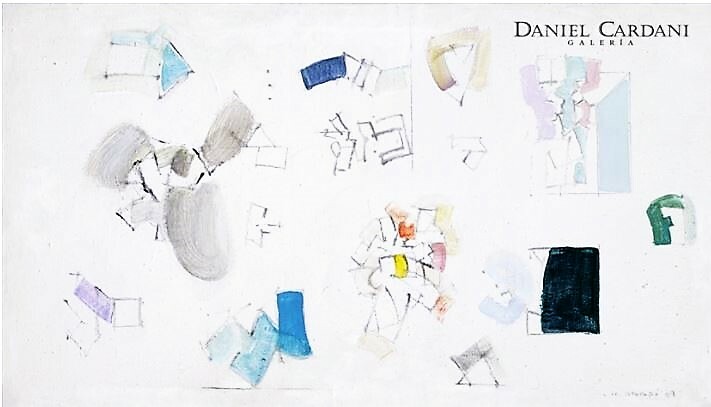 He suggests the chaos and colour of the market place with abstract shapes positioned across the page some with bright colours but often a muted grey or blue. Much of the page is blank with spaces between the elements of the painting. These spaces between the elements is usually typical of Mompó’s work but here may signify the market stalls each having a separate pitch and the spaces and aisles between them. The hustle and bustle are represented by the small tight drawing places and the twisting, spinning shapes around the page. A Finnish – English artist, musician, and vocalist born in 1982 in Sussex. Having studied Environmental Art at Glasgow here practise now involves various projects. These projects are joint collaborations with others bringing together various elements such as vocalists, drawing and recordings made from nature. 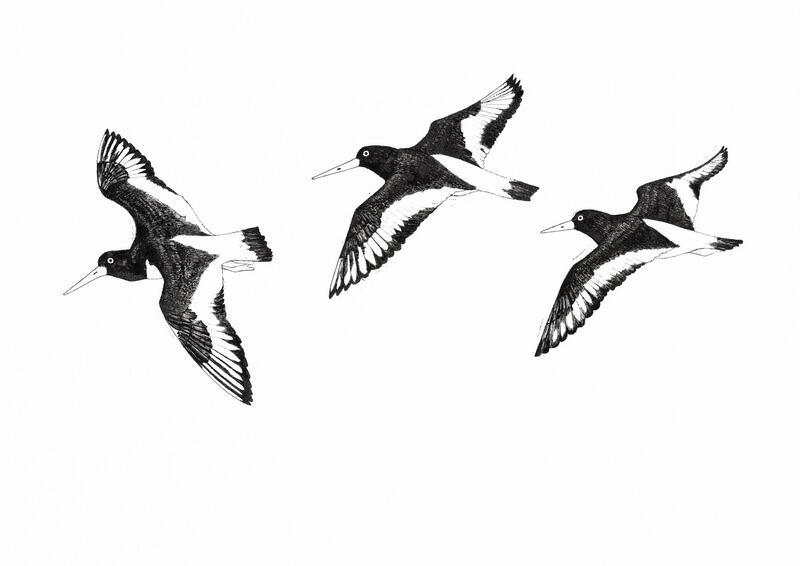 This has cumulated in her most recent project for Score in 2014 called “Away with the Birds”. This project was four years in the making with its cumulation a performance on the Isle of Canna, Hebrides, Scotland, in the summer of 2014. It was commissioned as one of the closing events of the Glasgow 2014 Cultural Programme. 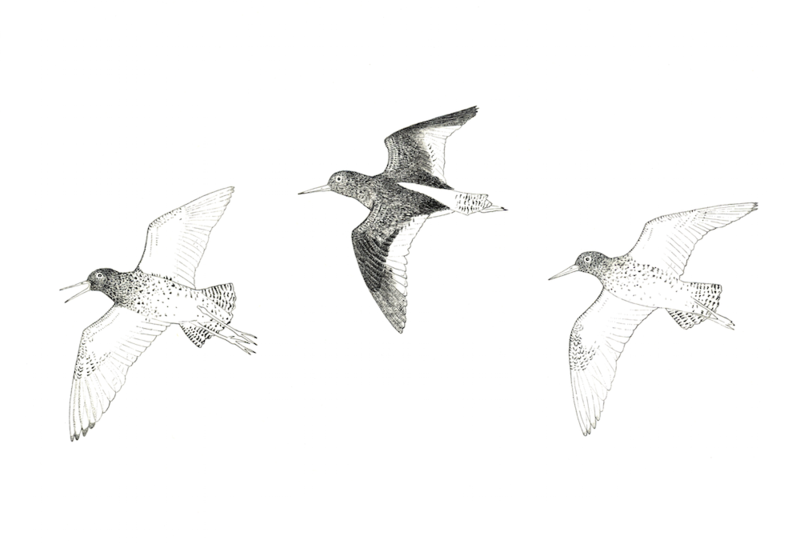 The website for the project has a body of work comprising several hours of music, commentary and dialogue plus film and field recordings of bird song and the sounds of nature along with drawings, songs and poetry. Tuulikki combines various natural elements to create not just a visual event such as a drawing or installation but an event that resonates with several senses. Your eyes and ears are the main senses simulated but this triggers your sense of smell to evoke the salt spray as you listen to the waves on the shore and whisper of the wind in the location recordings. Another project Tuulikki has been involved in have been utilised projected images of flora and fauna silhouettes onto a row of condemned and boarded up houses in Dunfermline. This blend of performance art along with the other elements including musical composition, drawing, costume and site recordings create a story of the land and nature and though she has vocals in her work they often recreate the sounds of nature rather than of man. Where the sound of man (or in this case woman) is hear it is in harmony with nature rather than opposing it. Her work lends a harmony to the environment and natural landscape far removed from the urban destruction wrought by man as he uses nature to his own ends. 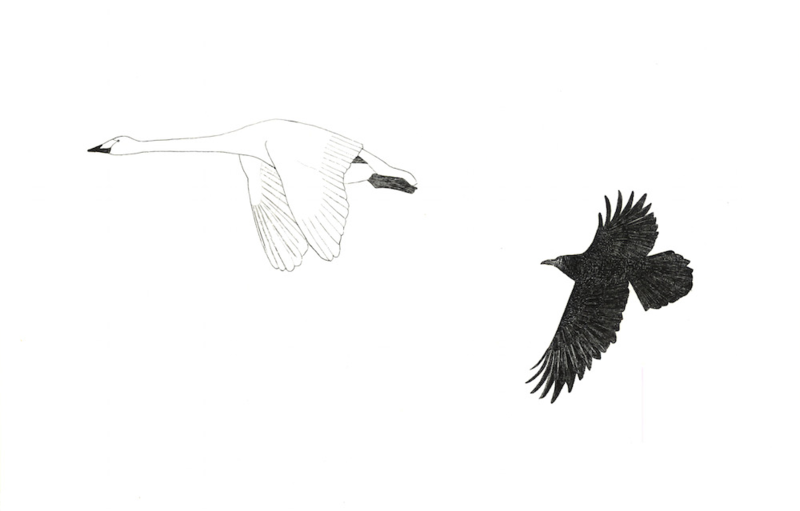 Tuulikki work harks back to an ancient time where man and nature were in balance and harmony. 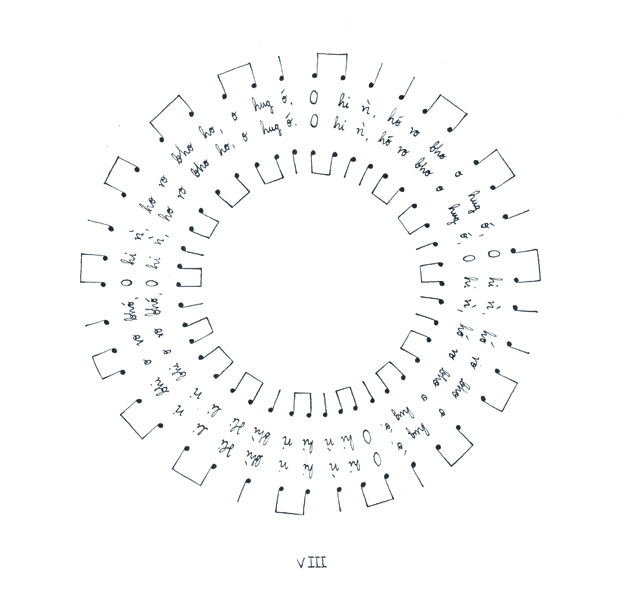 spinning-in-stereo is a composition for two voices, presented as an installation: visual score. 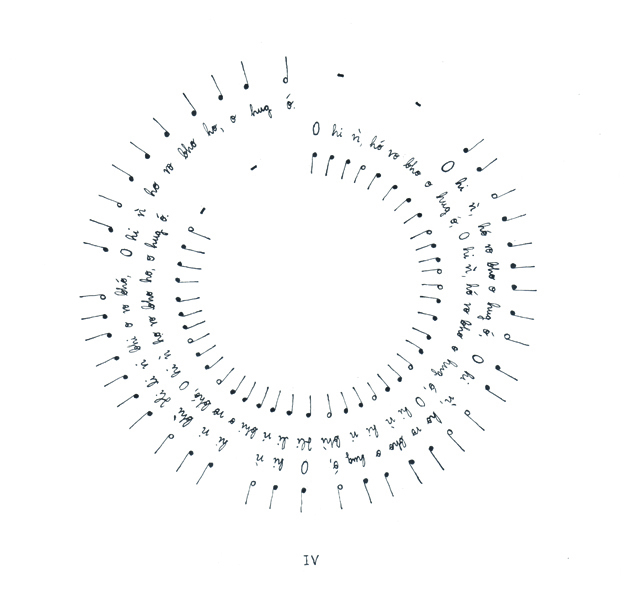 The piece adopts a traditional Gaelic spinning song, ‘Oran Snìomhaidh’, as the basis of a circular score. Beginning with elongated tones and ending with a steady pulse, the arrangement moves through fourteen revolutions, each with a different emphasis in terms of time, rhythm and/or pitch. As it turns on the record player, spinning-in-stereo echoes the cyclical, rhythmic nature of working with wool, from caring for the sheep out on the hill, to carding, spinning, and the waulking of the tweed, with it’s renowned song tradition. 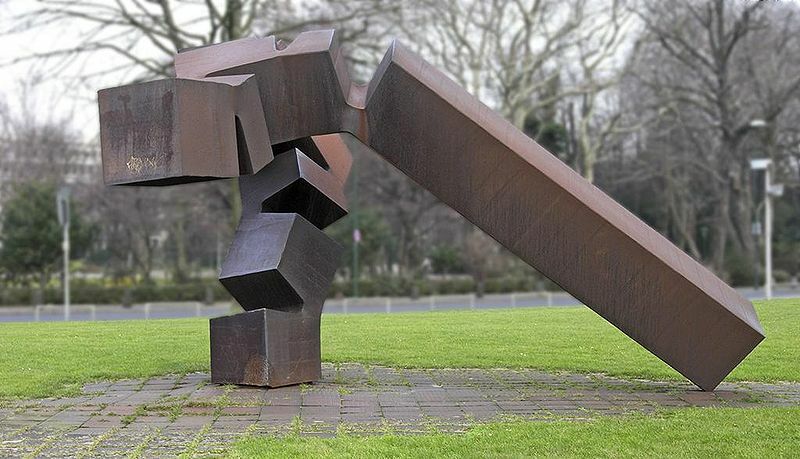 Lived from 1924 to 2002, he was a Spanish Basque sculptor renowned for his monumental abstract works, as well his drawings and other artistic output. However, initially he settled on a footballing career as a goalkeeper until a serious knee injury ended that promising career. He then embarked on a series of studies in architecture. 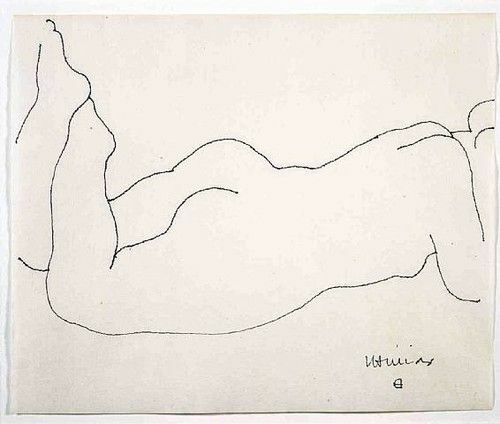 However, he abandoned this after three years finally settling on the study of art. He moved to Paris opening a studio and commenced private lessons in art as he had not completed his degree. He returned to Spain after spending several years in France and marrying. Despite the massive scale of his sculptural works they have a sense of movement and tension. Usually labelled with his native Basque language titles he has found fame around much of the globe with his works both widespread and prominent. 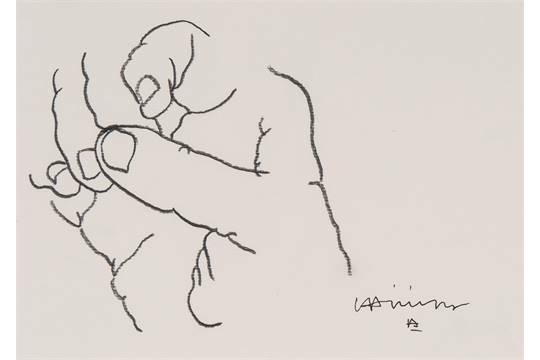 His works on paper and in some part preparation drawings for his sculptural works but also works in their own right.. his drawing style is reminiscent at times of early Picasso. 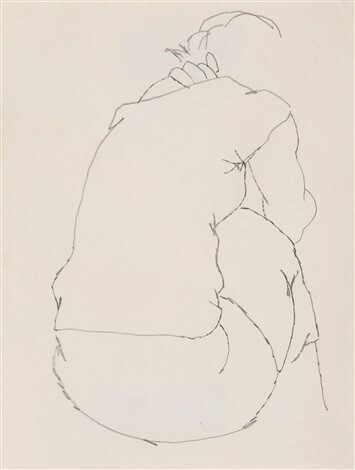 Many of his drawings are done in a bold dark line showing a confidence to depict the figure or hands. They are done from life and this shows as they as they have an immediacy and direct presence.